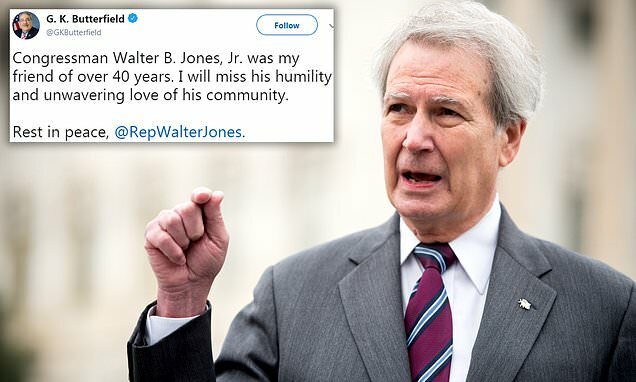 Walter B Jones, a 24-year veteran of US Congress, has died on his 76th birthday. The Republican congressman died in his Greenville, North Carolina, home Sunday, his office said in a statement, three weeks after he suffered a broken hip and underwent surgery. His health began deteriorating and on January 26 his family announced that he had entered hospice care and asked for their privacy. Jones had battled a multiple illnesses recently and was granted a leave of absence from Congress late last year after missing House votes since September. 'He was known for his independence, and widely admired across the political spectrum,' his office said in a statement. 'I will miss his humility and unwavering love of his community,' Butterfield said.